The official NRA BB Gun Rules are available to download from the NRA web page. Questions were taken from the downloaded copies of the Jan. 2014 NRA BB Gun Rule Book, the NRA 2014 updates to the NRA BB Gun Rule Book, and Daisy Ten Lesson Curriculum revised January 17, 2013. 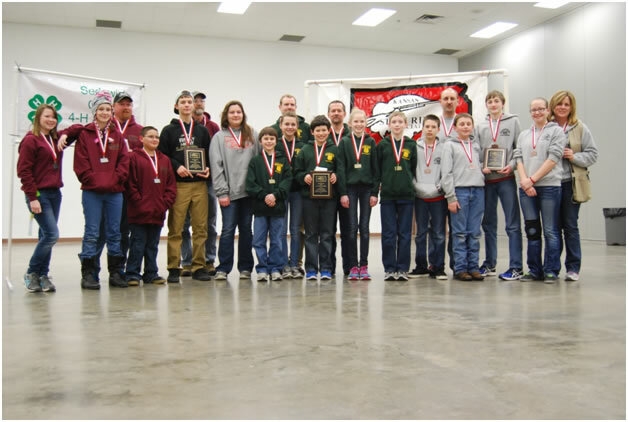 Ten teams comprised of 76 young shooters from all over Kansas took part in the 2015 KSRA-sponsored Kansas State B-B Gun Championship held in Wichita, KS on a snowy February 28, 2015. Shooters fired, in relay fashion, 10 shots in each of four positions, prone, standing, sitting and kneeling at targets 5 meters away. In addition, each shooter had to take a 50-question test on safety, gun knowledge and the NRA 5-meter BB Gun rule book. As a result, each shooter had the potential to earn 500 points possible. Team members’ scores are then added together and the top three scoring teams earn the eligibility to represent Kansas in the 50th Annual Daisy BB Gun Championship Match in Rogers, Arkansas in July, 2015. 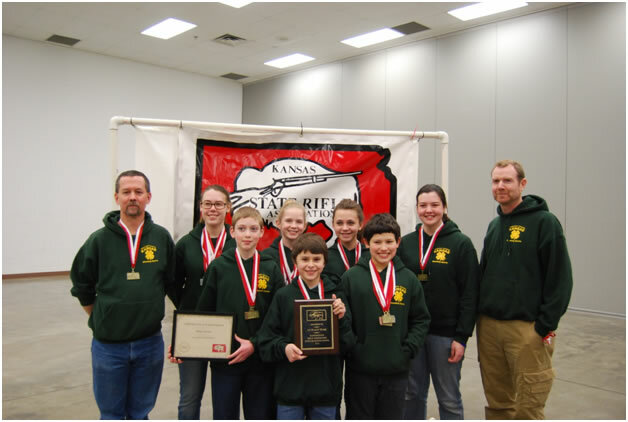 Johnson County 4-H Rifle Club earned top team with four of their shooters placing 1st, 2nd, 3rd, and 4th individually. The total team score for Johnson County was 2350. Team members were Daniel Smith, Justine Wheeler, Chase Eccles, Liza Rogers, and Ben Rogers. They were coached by Shannon Wheeler and Mike Smith. 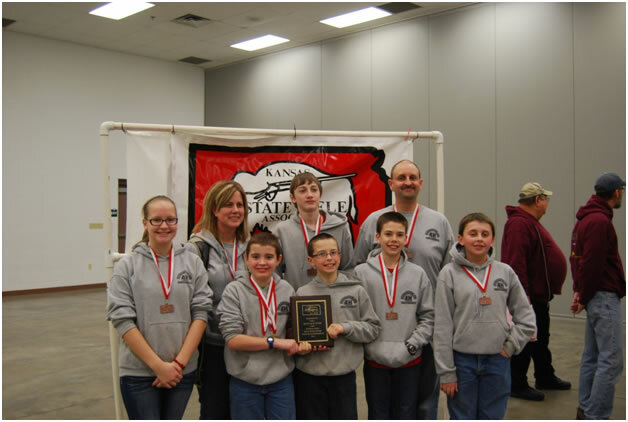 2nd place team was award to Wyandotte County Gold team with 2309 points. Team members were Kaitlynn Daniels, Sadie Bird, Courtney Sutton, Ethan Harrity, and Levi Mackey. They were coached by Alan Daniels and Tim Bird. 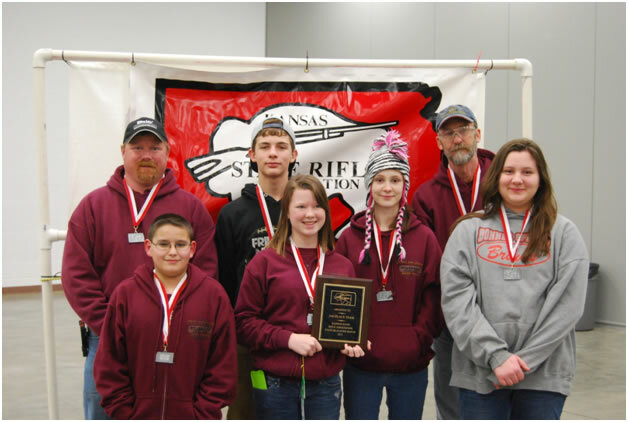 3rd place honors were earned by Sedgwick County 4-H Shooting Sports Gold Team. Team members scoring a total of 2269 points were Brian Simon, Caden Thul, James Jones, Kara Harden and Mary Klausmeyer. They were coached by Tracy Thul and Susie Klausmeyer. Two athletes earned the distinction of scoring a perfect score on the written test. They were Chase Eccles of Johnson County and Mary Klausmeyer of Sedgwick County.